TMZ.com has the details of former WWE wrestler Chyna allegedly assaulting a “longtime female friend.” Gabriela Targos says Chyna “punched her in the face, dragged her by the hair (and) beat her with a wire hanger” before threatening to kill her. WWE BANS METAL FOLDING CHAIRS! World Wrestling Entertainment has updated their “wellness policy” and banned the use of hitting opponents with metal chairs. WWE has removed folding chairs from events as part of their plan to battle concussions. No more John Cena folding chairs.“Official WWE Chairs” have been removed for sale from the company’s web site. Boy, is Neil Cavuto going to be pissed. The Fox News Channel host often complains that President Barack Obama will go on ANY television show as long as it’s not on Fox. He may have a point. For the first time in history a U.S. president is going to make an appearance on a professional wrestling program. Sadly, President Obama is not going to don a cape or fight John Cena. Instead, President Obama has taped a message to U.S. soldiers for the WWE’s upcoming “Tribute to the Troops” special. Famed wrestling manager Lou Albano died today. He was 76. A 65-year-old prostitute has been arrested in Mexico in connection with the murder of twin midget wrestling stars. Alejandro and Alberto Jimenez were found dead in a Mexico City hotel room earlier this summer. The Jimenez brothers were two of Mexico’s most popular midget wrestlers. Police say they overdosed and died after they were drugged by a pair of prostitutes who failed to take into account the brothers’ diminuitive stature. Authorities say roving gangs of prostitutes often drug men in Mexico City then steal their wallets. The 65-year-old woman who was arrested is a known prostitute. She is seen on a surveilance tape entering a hotel room with the Jimenez brothers, who were found dead the next morning. Authorities are still looking for a second prostitute who they describe as “the fat one.” Police theorize the hookers put eye drops in the Jimenez brothers’ drinks. Two of Mexico’s most popular midget wrestlers are dead. Twin brothers Alberto and Alejandro Jimenez were found dead in a Mexico City hotel room, apparently the victims of prostitutes who were attempting to rob them. According to several tabloid reports, the Jimenez brothers picked up two hookers and took them to a hotel room. Hours later, the women apparently left the room alone. Cleaning staff found the bodies of the brothers in bed. According to the British tabloid The Sun, it is common in Mexico for “gangs of prostitutes” to drug their clients and rob them. The Jimenez brothers apparently overdosed on tainted drinks slipped to them by the prostitutes. They were killed by an overdose of eyedrops and alcohol. The doctor who was supplying professional wrestler Chris Benoit with steroids and HGH at the time of his death has pleaded guilty to charges of conspiracy and distribution of prescription drugs. Dr. Phil Astin pleaded guilty to 175 charges. He will be sentenced in May. Benoit was taking anabolic steroids, given to him by Dr. Astin, when he killed his wife, his son and himself in 2007. 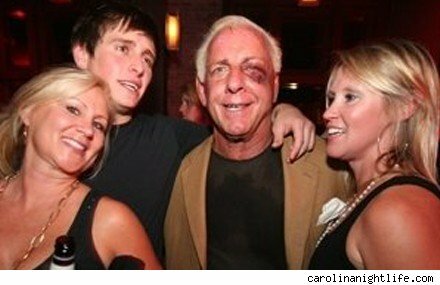 Wrestling legend Ric Flair was beaten up by his daughter’s 22-year-old boyfriend. The brawl took place in a North Carolina parking lot. Worse, when police tried to arrest Flair’s 21-year-old daughter, she kicked one of the cops. Police TASERED her.